Confederate Flag 'Has To Come Down' In S.C., NAACP Leader Says : The Two-Way Calling Wednesday's killing of nine black church members in Charleston, S.C., a hate crime, the head of the NAACP says it's not appropriate for South Carolina to keep flying the Confederate flag. 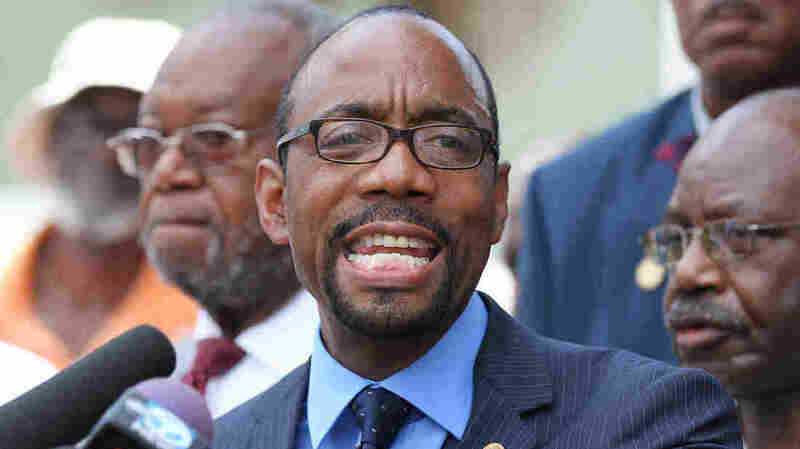 Saying that it's time to "confront the racism in our midst," NAACP National President Cornell William Brooks called on South Carolina to stop flying the Confederate flag on the grounds of its State House. Calling Wednesday's killing of nine black church members in Charleston, S.C., a hate crime, the head of the NAACP says it's not appropriate for South Carolina to keep flying the Confederate flag at its state house. "The flag has to come down," NAACP President Cornell Brooks told a crowd gathered for a midday news conference Friday. "This was not merely a mass shooting, not merely a matter of gun violence," Brooks said. "This was a racial hate crime, and must be confronted as such." "We say this not because we're trying to sow division, but rather because we're trying to sow unity — a unity of purpose, a unity of commitment, a unity of resolve — so that we confront the racism in our midst. "And that means, certainly symbolically, we cannot have the Confederate flag waving in the state capitol." A symbol of the Confederate flag was on the car that police say Dylann Roof, 21, drove to Charleston's historic Emanuel A.M.E. Church Wednesday, before opening fire on those gathered for a Bible study meeting. A photo of Roof on social media shows him wearing symbols of the flags of apartheid-era South Africa and white-ruled Rhodesia. Roof was captured Thursday and arraigned Friday afternoon, in a court proceeding that included emotional statements from the victims' family members. 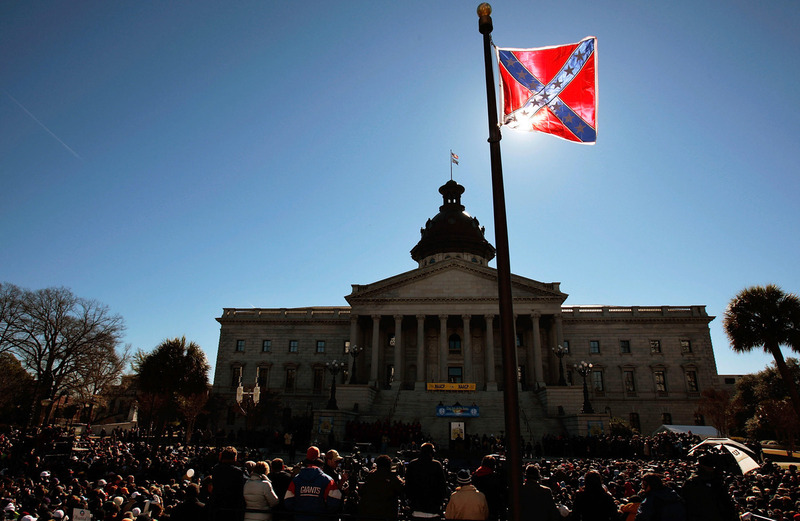 A Confederate flag that's part of a Civil War memorial on the grounds of the South Carolina State House flies during a Martin Luther King Day rally in 2008. The state is under fire for continuing to fly the flag. "When we see that symbol lifted up as an emblem of hate, as a tool of hate, as an inspiration for hate, as an inspiration for violence — that symbol has to come down, that symbol must be removed from our state capitol." "The NAACP has been calling for tourists and businesses to boycott the state for years due to the flying of the flag. In 2000, activists won a small compromise by having the flag removed from the Statehouse dome and placed atop a memorial to Confederate soldiers on the Statehouse grounds. However, the flag remains highly visible; it is the first thing you see as you approach the Statehouse from the north on Main Street." In his remarks, Brooks noted that he has spent a great deal of time in Charleston as a youth, and that he had grown up nearby. He also said that like other generations of his family, he is an African Methodist Episcopal minister. "This tragedy hits close to home," he said. In the wake of the killings, Brooks said, "we're all coming together, and we're saying, yes there may be multiple sides of this debate. But we all have to be on the side of those who lost their lives in a church." Russell Moore, president of the Ethics and Religious Liberty Commission of the Southern Baptist Convention, also says the Confederate flag should come down. A White House spokesman Eric Schultz says, "The president has said before he believes the Confederate flag belongs in a museum, and that is still his position."